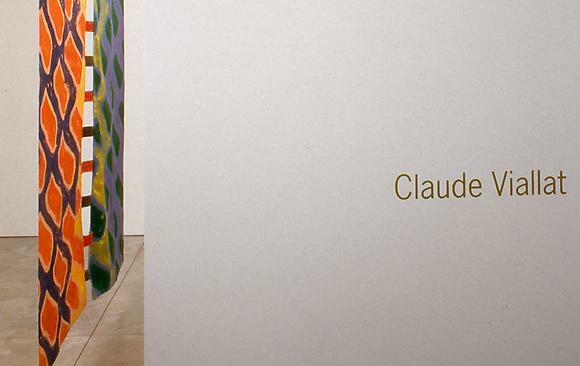 Born in Nimes, France in 1936, Claude Viallat last exhibited in New York in 1982 at the Leo Castelli Gallery. He attended the Ecole de Beaux Arts de Montpellier in the South of France (1955-1959) and the Ecole des Beaux Arts de Paris (1962-63); His first solo show was in 1966 and by the beginning of the seventies, he became one of the leaders of the group "Support-Surface". He founded the group with fellow artists such as Bioulès, Cane and Dezeuze after a period of intense experimentation in the south of France, where he installed his works in various non-institutional spaces such as farms, a beach, the bed of river, etc. In a context of radical questioning social norms and values, this group of artists attempted to break up the convention of painting by deconstructing the concept of the stretcher (support) and canvas (surfaces). The group had its first show at the Musée d'Art Moderne de la Ville de Paris in 1971. Working on the idea of repetition Claude Viallat is known for his emblematic "shape" which evokes both a net or flat knot. Applied with a brush and a stencil, this shape acts as a signature of his works, which are never signed. By repeating this shape on a variety of surfaces, unprimed un-stretched canvas, free floating pieces of material and clothes, the artist frees himself of the limits of composition to focus on the combination of colors and its optical effects. Along with this experimentation in painting, Viallat has also pursued work on found objects (pieces of wood, ropes) and combination processes (braiding, knotting etc.). "Viallat's work is a little like this too. Blinded by the form that is nothing more than a pretext, bothered by the incongruous and vulgar supports, the spectator will sometimes be thrown off course. He or she will think that it is all the same where in fact there are only extreme differences and perpetual beginnings. It is interesting to note that the work continues to resist forty years later. For certain observers, painting on such non-conformist supports, or relying on the pictorial conventions of the decorative arts, is still a way to brave prohibitions. These reactions are interesting given the reigning atmosphere of conformity that even the most novel approaches do not escape. In any case, they serve as proof that Viallat remains pertinent. Far from applying his pre-established system, in the manner of certain minimalists, Viallat incessantly puts it at risk, in the image of the bull's horn entering painting's flesh and constituting its truth." Claude Viallat is in numerous museum collections including Musée National d'Art Moderne, Fondation Cartier, CAPC Bordeaux, Museum of Modern Art, The Kunstmuseum Basel, and the Musée des Beaux Arts de Montréal.